HomeAhmadinejad Was Heard — Were We? Ahmadinejad Was Heard — Were We? And then the shofar was sounded. For the first time the crowd stood still. The sound carried to the United Nations building across First Avenue. First a long blast and then the short staccato wailing sounds, reflecting the brokenness of too many in Israel and the world today, and then again the long tekiya, as if declaring against all odds we will prevail. When it was over, the crowd broke out in applause. Hearts and souls were finally touched, and the assembled were saying thank you. The scene was from the September 24 Stand for Freedom in Iran Rally. The demonstration was organized by a wide array of Jewish organizations, joined in coalition with unions, civil rights groups and others concerned about the threat that the Iranian regime poses to the world community, to Israel and to its own people. But for all the good intentions and hard work of the rally’s organizers, something was missing: people. Space was set up for an overflow crowd. That area remained empty. Even the back half of the rally space was sparse. Students were milling about as if it were some camp reunion. It was good they came; they are our future. But the youngsters were uninvolved. And truth be told, the lack of passion from our teens was understandable. The rally lacked inspiration. Political figure after political figure, and organizational representative after organizational representative, spoke, some rehashing the same points, others holding forth quite eloquently. But there was hardly any song, any prayer, any sense of spirituality. The opportunity to touch the souls, especially of the teenagers in attendance, was lost. Rabbis, who should be the source of this inspiration, have been relegated by the Jewish communal establishment to ritual roles, giving invocations and benedictions rather than playing a central role in shaping our response to the most critical issues of the day. Moreover, the talking points of the rally and of its speakers were misplaced. The first three agenda items dealt with the democracy movement in Iran, which is to be supported but whose leadership is often anti-Israel. Iran’s danger to Israel, its nuclear aspirations and state-controlled terror threatening Israel and the United States were sorely underplayed in the framing of the rally’s overall message. And why were so few people there? Why, only 65 years after the Shoah, did tens of thousands more not show up to protest Mahmoud Ahmadinejad, the man who threatens the very existence of Israel and who may soon possess the means of carrying out his threats? The rally’s shortcomings reflect the fact that our community has been lulled into complacency, perhaps by our comfortable status as Jews here in America. This should be cause for serious communal self-reflection. We rabbis should be the first to take a critical look at our own failings. Clearly, we did not do our share — and I certainly did not do mine — to successfully inspire our congregants to turn out. Even if our community seems unmotivated, the role of a spiritual leader is to motivate, to get there first, to make the issue a priority and then cajole, demand and declare acharei — after me. To that end, an attempt was made a day before the rally to have many, many rabbis arrested near the U.N. in an act of peaceful civil disobedience. Such actions should never be taken lightly. Breaking the law is a serious matter. But sometimes it’s necessary in order to underscore the urgency of a threat. And this was one of those times. It was a time of confrontation, with the Iranian president’s rhetoric more fiery than ever; and New York was, for a moment, the epicenter of that confrontation. The evil man was speaking right there at the U.N. Here was an opportunity to echo the Soviet Jewry and anti-apartheid days when hundreds of spiritual leaders were arrested in front of the Soviet and South African embassies and missions. In the end, only 50 rabbis — wearing tallitot and blasting shofarot — blocked First Avenue. Twelve of the rabbis refused to leave the street and were arrested. It was a powerful moment. But many more should have been there. With all good intentions, Jewish communal leaders — including us rabbis — dropped the ball. We rabbis are the ones who are supposed to sound the alarm, the shofar blast that declares “wake up, the time has come for action.” We are the ones who are supposed to lead with the message of the shofar — addressing political realities in spiritual terms — by sounding the broken sounds of pain and suffering and then the tekiya, the raising of a voice of moral conscience. We are supposed to do all of that, especially during these Days of Awe. But we didn’t. We missed giving the best sermon, not the sermon of words, but the sermon of action. Avi Weiss is senior rabbi of the Hebrew Institute of Riverdale and national president of AMCHA-The Coalition for Jewish Concerns. This story "Ahmadinejad Was Heard — Were We?" was written by Avi Weiss. Rabbi Avi Weiss is founding rabbi of the Hebrew Institute of Riverdale and founder of Yeshivat Chovevei Torah and Yeshivat Maharat rabbinical schools. 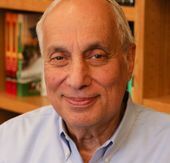 He is a longtime activist for Jewish causes and human rights.